"Casey Jr. Circus Train to be Modified: Will Re-Open as Seven-Inversion Launched Coaster." 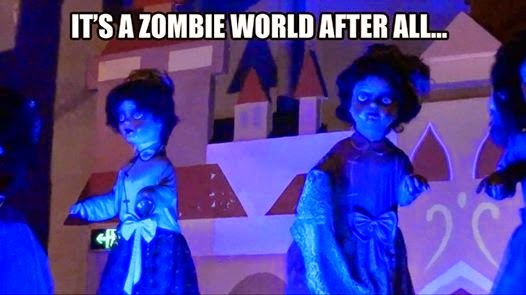 "Small World to Receive Halloween Overlay Tribute to Michael Jackson's Thriller." "Alice in Wonderland Closed Again to Address Concerns of Center Rail as Potential Trip-Hazard. Airbags to be Installed on All Caterpillars." "Access our Premium Press Releases by Joining 'Media Relations in Wonderland' for a Modest Annual Fee"
China already does that one. "All pirates in Pirates of the Caribbean to be changed to women." "Haunted Mansion to be permanently changed to Haunted Mansion Holiday." "MaxPass to completely replace FastPass. Price increase forthcoming." "Innoventions building changed to private vlogger lounge." "Mr. Toad's Wild Ride and Peter Pan's Flight to be replaced with Disney's Thawed™ Kuuma's and Irriterande's Beach Time Boogie"
"Walt Disney Returns From the Dead; Says 'No, You Don't Know What I Would Have Done'"
5 minute mid-ride vehicle stoppage to become permanent on Space Mountain for Cast Members to try to sell you a DVC membership. "Fans of the space which formerly hosted Snow White's Wishing Well will love its magical re-imagining when they step into Live-Action Princess Jasmine's immersive new DVC kiosk experience, inspired by Disney Marvel Lucasfilm Pixar's Guy Richie's new LIVE ACTION film Aladdin, inspired by Disney's Aladdin. Now under construction (opening in 5 years)"
Don't forget to pick up the new Large size plush DVC Cast member and DVC Kiosk stuffed animal in one of the 3 gifts shops on your way out! "Well-made unique 4D attraction closing down to show commercials. " Fastpass for every attraction because it works so well at WDW. We've just announced a brand-new premium experience that Guests will love! Disney "Whistle While You Work" Premium Experience, presented by Lowe's, will put you in the middle of the magic at Disneyland and Walt Disney World Resorts as never before. On select mornings, you and your group will be granted access to Disneyland park (Disneyland Resort) or Magic Kingdom Park (Walt Disney World Resort) before park opening for this truly magical experience that will help you make memories to last a lifetime. Just sign our mandatory legal waiver absolving us of any and all responsibility should you be injured or die, grab a tool (supplied by Lowe's) of your choice (the Mickey-shaped hammer is a favorite among Guests!) and "Whistle While You Work!" as you help bring Disney Parks up to tip-top shape via the magic of manual labor. And, at the end of the Premium Experience, you'll be given an exclusive Lowe's-branded "I Helped Build Disney Parks" pin, and, best of all, a cupcake! After the Premium Experience concludes, you will not be allowed back into the park unless you buy a regular admission ticket. They can't do any worst than real imagineers. There would be many on this and other fanboards that would sign up for that in a heartbeat. "Disneyland to unveil new Restroom FastPass System"
Tired of waiting in long queues in the bathroom? Get a Fastpass! When you time your tinkles, you'll be able to maximize your day at the parks! I think you misspelled MaxPass.. Lost revenue there!